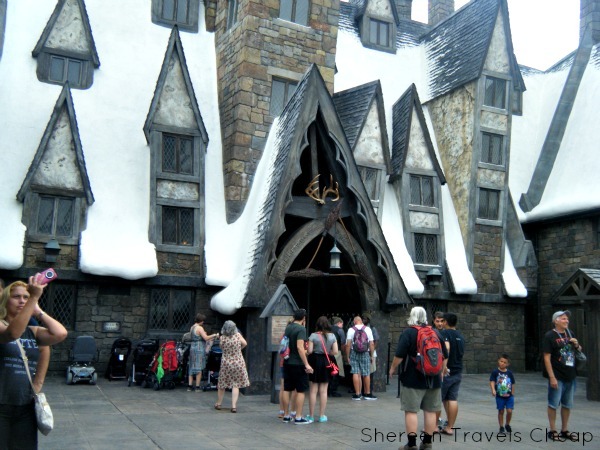 By now you've read all about my visit to to Hogsmeade, Diagon Alley and Knockturn Alley at the Wizarding World of Harry Potter at Universal Orlando. I saved the best for last, because the food is actually really delicious. I don't mean in comparison to theme park food. I just mean in general. 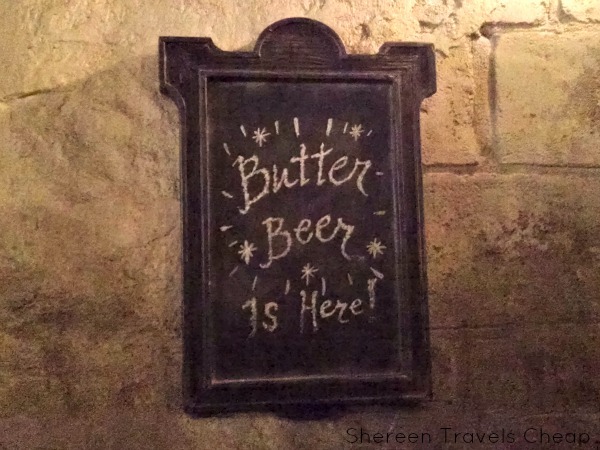 Of course, most people come to Wizarding World with a singular food goal: Butterbeer. Butterbeer is the iconic Harry Potter beverage. Despite popular belief, it is non-alcoholic (I mean, kids drink it). I'd had it in two forms the last trip I made and while at the Warner Brothers Studio Tour in London, but it's now available in a third delicious option. 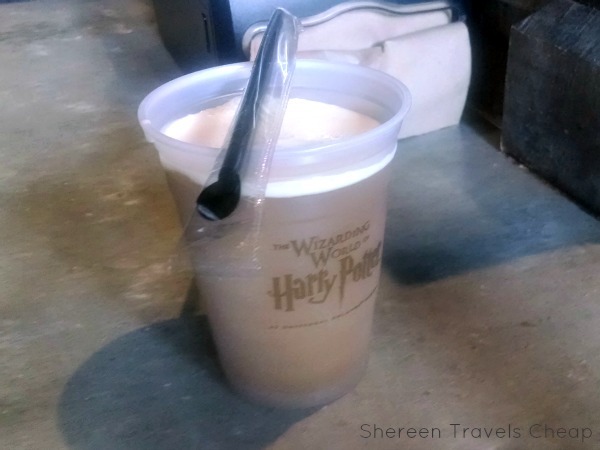 Cold Butterbeer is highly popular, especially in Orlando. (Also, that chocolate trifle is fresh and delicious.) It's cream soda based, so it's sweet and frothy. Though yummy, cold Butterbeer is now my least favorite of the three. If you're feeling really hot, frozen Butterbeer is where it's at. This is my second favorite form of butterbeer. It's totally refreshing and I could drink it all day, if it wouldn't make my teeth fall out. My favorite, and the newest form of Butterbeer is hot. It's like a latte mixed with hot vanilla milk. It may have been 85 degrees outside, but I was willing to make the sacrifice to be able to tell you how it compared to the other two. If you're here in the morning, which you should be, order this instead of coffee. 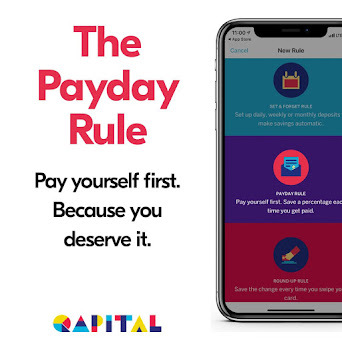 You'll thank me. 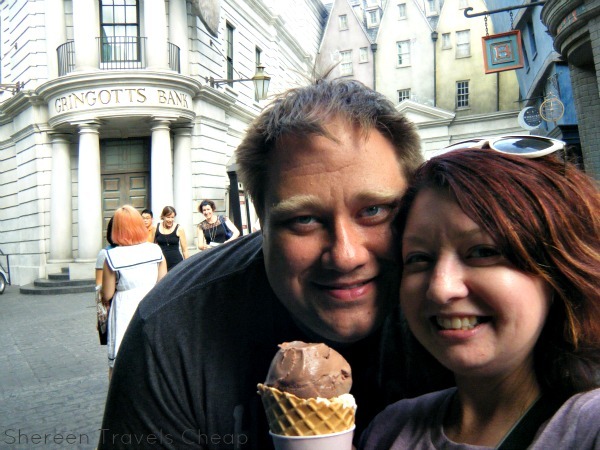 You can purchase Butterbeer at the Three Broomsticks in Hogsmeade, The Hopping Pot, and the Leaky Cauldron in Diagon Alley, plus you can get cold and frozen at Butterbeer stands in each. 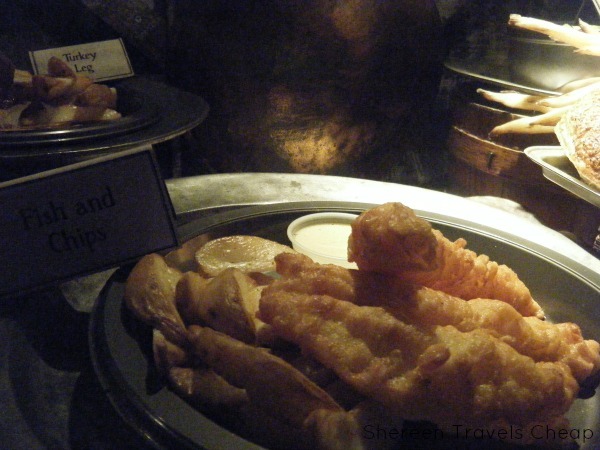 Speaking of the Leaky Cauldron, I was really excited to eat there. I mean, everyone in the Wizarding world uses it as a gateway. This one doesn't have old Tom, but they have a fantastic dining room. You order at the counter, are taken to a table and served by staff that has these awesome hats. I tried to buy one, but they only had something similar in brown. Boo. They looked soft and comfortable, plus everyone looked fantastic in them. We made a point to eat here twice, and I would have eaten there again if we had been there longer. Look at that Weasley-sized cauldron! You feel like you're really inside Harry Potter's world when you're here. Everywhere you look there's something to see, from the staircase leading up to the rooms above the tavern, to the crooked pictures along the wall and the fabulous high ceilings. There were also a lot of Brits there when we visited, which I though was pretty cool. 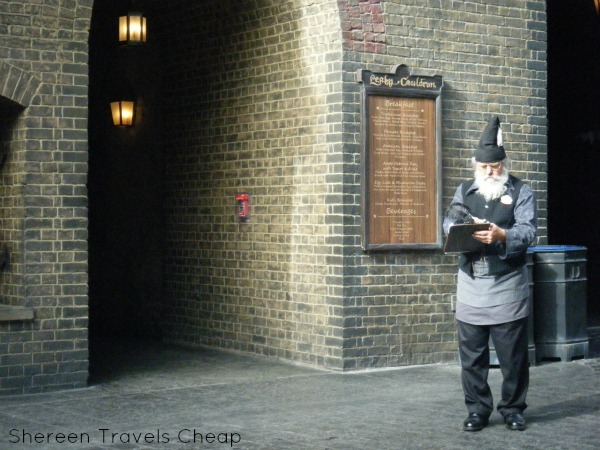 They may have the Warner Bros. Studios with all the sets, but they have nothing on actually being inside the Wizarding World with the actual shops and wizards hanging about. First up, let's talk about their breakfasts. We made the mistake of ordering coffee, which was so hot that it was barely cool enough to sip by the time we were finished with our food. This might be how they get out of refills. 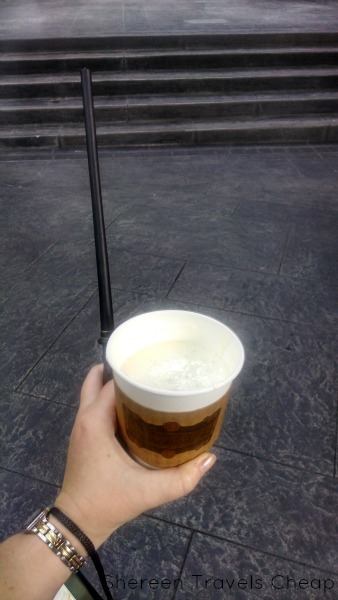 What you should do instead is order a hot Butterbeer. Eric went for the pancake breakfast and totally snarfed it without a photo. It came with three buttermilk pancakes, bacon, sausage and a croissant. Obviously, he didn't have any complaints. I tasted the pancakes and they were pretty good. Not dry at all and flavorful. I wanted to try something different, but I didn't think I could handle the traditional breakfast, so instead went with the Egg, Leek and Mushroom Pasty. Oh. My. Goodness. was this good. As you can see it came with potatoes and a mass of fruit. 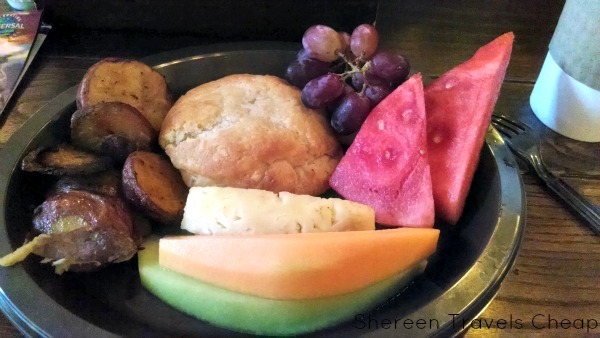 I shared some of the fruit with Eric, but that pasty (pronounced pass-tee) was amazing. The flaky biscuit was full of the perfect combination of eggs, leeks and mushrooms and it totally filled me up. All the morning dishes, with the exception of the kids meal, are $15.99, but I thought it was well worth the price. Moving on to lunch (and dinner), we made another trip to the Leaky, because why not? They have some great traditional options here, instead of chicken sandwiches and hamburgers. It makes a nice change, plus gives you a sweet little taste of the UK. I love that they have a window that displays the food selections, so you can kind of make up your mind before you get in line and handed a menu. 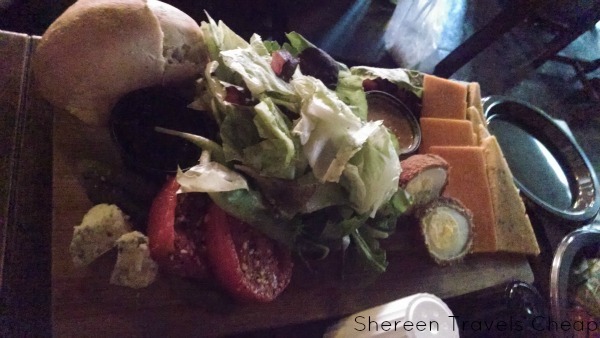 Eric went with the Beef,Guinness and Lamb Stew, which came with a side salad and I went big with the Ploughman's Platter, which claimed to serve two. I know Eric was torn between getting something else that came with a Scotch Egg and I wasn't starving, so a salad with cheese and bread sounded like a nice light option. 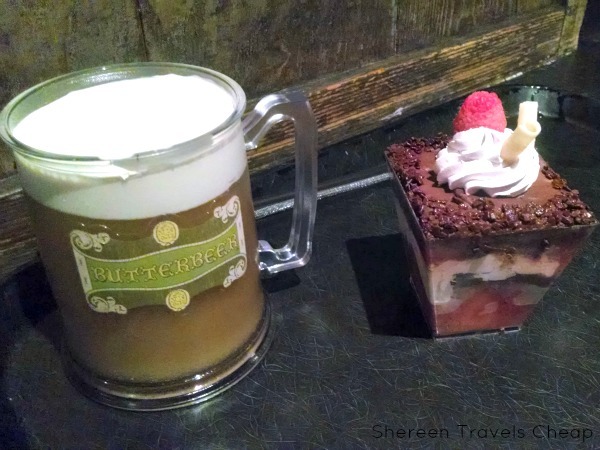 We didn't make the mistake of not ordering Butterbeer this time, but to even it out, I tried the Peachtree Fizzing Tea. Make sure to ask for sweetener for it though, because it's not that fizzy and kinda blah without it. The stew was probably one of the best I'd ever tasted. My salad was good; however, some of the cheese was kind of flavorless. It may have been better with the mustard, but I don't eat mustard. Eric loves mustard and said it was too strong for him. It was okay, but I wouldn't get it again. If you're really hungry, this won't serve two of you. 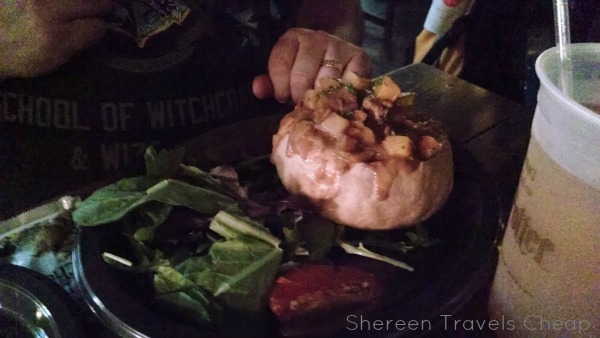 Since Eric said we couldn't eat all our meals a the Leaky (I beg to differ), we compromised and went to lunch at the Three Broomsticks in Hogsmeade. I had eaten here before and didn't get a chance to try everything I wanted. The tavern is attached to the Hogs Head Pub, which sells alcohol, like Firewhiskey, and has a giant hog's head on the wall behind the bar that intermittently snorts, which I find hilarious. You can hear it in the Three Broomsticks dining room. I love it. Just as in the Leaky, you can view the foods served here in a window. We decided to save money and order the Great Feast, which serves two. We had also just had huge ice creams, so we weren't actually hungry enough to have our own meals. 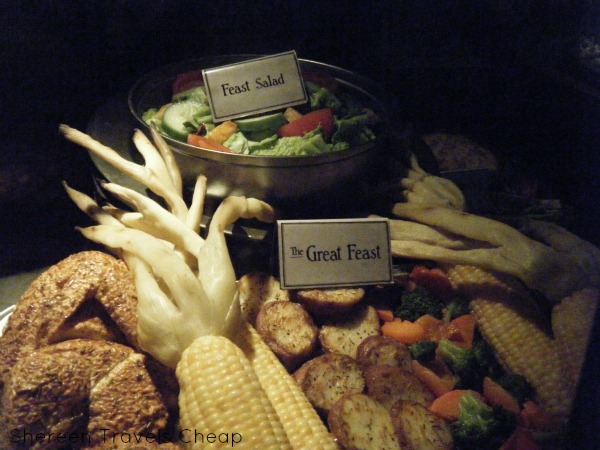 The Great Feast comes with ribs, chicken, fried potatoes, roasted vegetables and a giant ear of corn. It was perfect for our needs. We augmented with that lovely little trifle at the top. 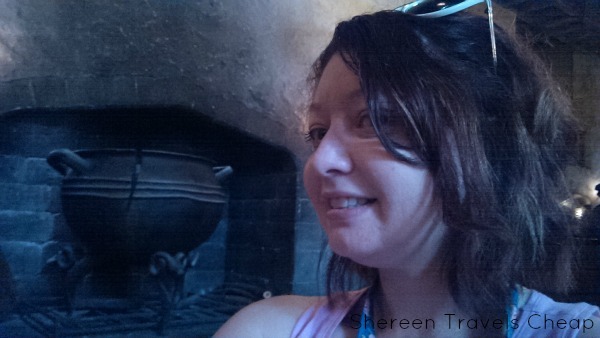 The decor is rustic and wooden in the Three Broomsticks, and exactly what you would expect. You order at the counter, pick up your food and drinks at another counter and then get taken to a table. I like that you're never on your own here. They also have outdoor seating that gives you a view of Hogwarts. Remember when Harry ran away from home, took the Knight Bus to London and lived in a room above the Leaky Cauldron before his third year? He spent his days studying(!) 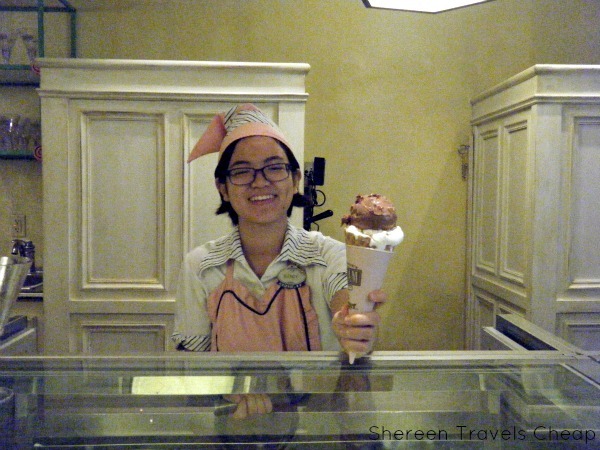 and eating free ice creams from Florean Fortescue's. Florean took a liking to him and gave him cones of sweet creamy goodness, like strawberry peanut butter. I would have tried that, but instead, I found two even better sounding flavors once we entered the delightfully pink ice cream shop. You can choose from soft-serve or regular ice cream and your cone comes with two flavors (you can also get a cup, but what the hey. Calories don't count on vacation.). Eric went traditional with mint and chocolate soft-serve. Basically, it all starts out as vanilla and the flavors get swirled in. I'm actually surprised he didn't go for Butterbeer. I will have to try that one next time. I chose sticky toffee pudding and chocolate chili, because I wanted something entirely different. I debated over clotted cream and lavender earl grey, which I would have gotten had we made a second trip like we were planning. If you like spice, the chocolate chili is fantastic. it's sweet, but hot, which can completely freak out your taste buds. The sticky toffee pudding was just cold and sweet, but with chunks of cake in it. I was glad that one was on the bottom, to cool off my tongue from the spicy chili. In the Florida heat, it's important to keep hydrated. 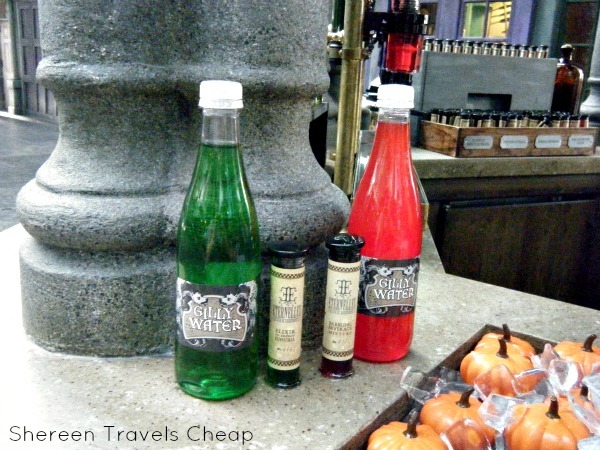 While in other parts of the park you can drink sodas all day long, you won't find any of that in the Wizarding World. 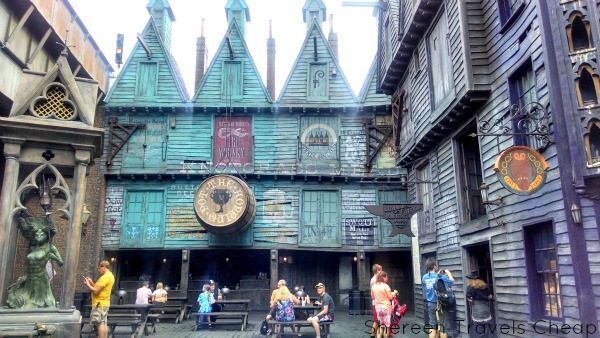 The Hopping Pot serves up all three types of Butterbeer as well as alcoholic drinks, plus they have a lot of seating for you to relax at and just soak in the atmosphere. I mean, look at that photo and imagine it being even better in person. One of my favorite drinks from the Harry Potter books is Pumpkin Juice. I've made some myself at home for parties and I could probably drink it all the time. 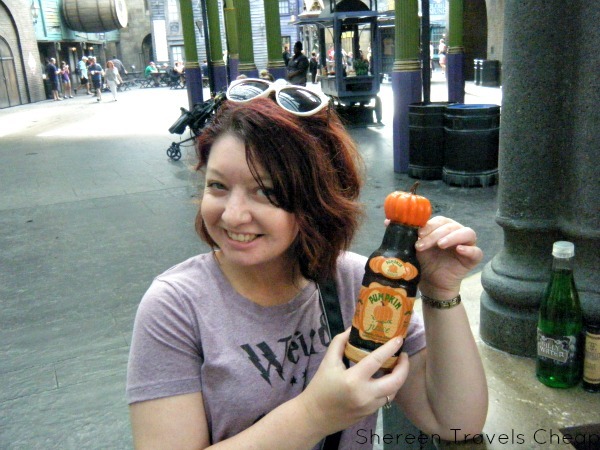 It's not cheap to buy at the WWoHP, but it does come in this adorable bottle with a pumpkin topper, which I brought home as a souvenir. If you like pumpkin flavored things and enjoy juice in general, this is a must-try. You can purchase it at the Fountain of Fair Fortune. Also at the Fountain you can find Gilly Water. Now, we aren't entirely sure what it is from the books, but here (and at my house), Gilly Water is just water. 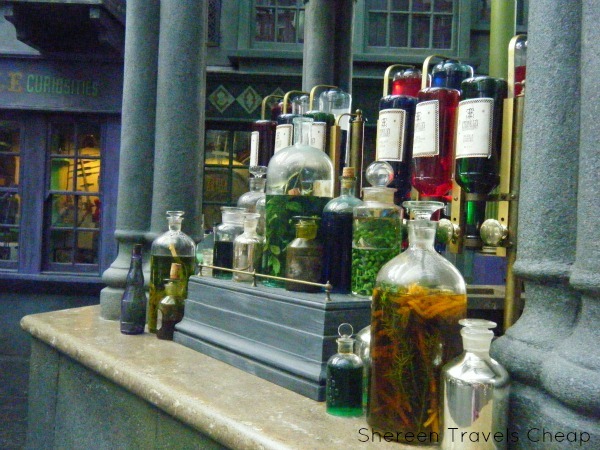 Universal makes it special by selling it alongside fruity flavorings disguised as potions, like the Draught of Peace. I know, it's a way to get more of your money, but you can also just buy the flavorings to use with your own water. Also, they're tasty if you are tired of boring old water. 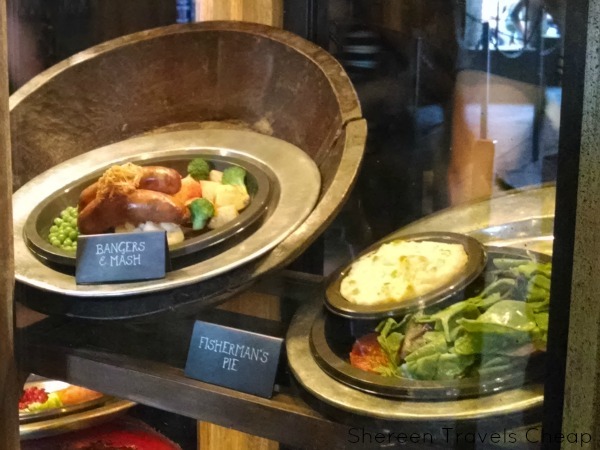 The Wizarding World has a good variety of foods and beverages and most are decently priced. Out front of King's Cross Station, you can hit up the potato kiosk that serves up jacket potatoes with all types of toppings. That's just a fancy name for baked potatoes. I regret I was never hungry enough to eat there as well, but there was always someone in line, so I'll definitely try one next time. All in all, I'd skip many of the in-park restaurants to eat at one of the restaurants in the wizarding parts of the parks. What have you always wanted to try from the Harry Potter series?